The macula provides the sharp, central vision necessary for reading, driving, and seeing fine detail. A macular hole is a small break in the macula, located in the center of the eye’s light-sensitive tissue, called the retina. Here at RMI we review who is at risk for this condition, and apply the most advanced diagnoses and sight-saving treatments available today. In 80% of cases, macular holes are associated with aging, most common in those over the age of 60. Near-sightedness, trauma, systemic diseases and inflammation account for the other 20%. Ten percent of patients will go on to develop the condition bilaterally. Females tend to be affected more commonly than males and there are theories suggesting its link with shifting estrogen levels around the time of menopause. Some of the most common symptoms include distortion, reading difficulty, or a blind spot in the center of vision (scotoma). If the non-dominant eye is affected, however, the condition may go undetected until recognized in a routine eye exam or when the good eye is accidentally covered while performing a visual task. While an ophthalmoscope is often used to detect a macular issue, additional tests may be required in order to confirm the presence of a macular hole. 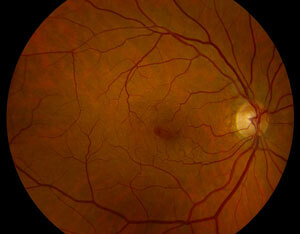 Such tests include flourescein angiography (FA) and optical coherence tomography (OCT). An FA may be used to identify associated conditions such macular edema from diabetic retinopathy or macular degeneration. An OCT is used to clearly identify a hole and any associated features, including an epiretinal membrane, vitreous traction and macular edema. full thickness hole of any size associated with complete posterior vitreous detachment (PVD). A vitrectomy is required for Macular Hole repair. This procedure entails the removal of the vitreous gel that fills the back of the eye and replacing it with a gas bubble. The fine internal limiting membrane (ILM), located around the edge of the hole, is often removed at the same time to increase the procedure’s success rate. These combined procedures are individually termed, as follows: vitrectomy, membrane peeling and fluid-gas exchange. An Intraocular Laser (“Endolaser”) may also be applied if holes, tears or retinal thinning is found at the time of surgery. Patients must remain face down for 4-14 days after surgery to achieve the best possible results. However, the prognosis for visual recovery is dependent on additional factors, such as the duration that the hole existed before surgery and the preexistence of conditions, such as macular degeneration. The purpose of the gas bubble is to hold the edges of the hole together while the retina heals. A face down positioning device, like a massage table, can be ordered to help patients comply with these instructions. All surgeries have potential risks and benefits as well as alternatives (e.g., observation) which should be discussed with your doctor. At RMI we provide the most advanced care to optimize recovery of vision.